Our Christmas and New Year programme follows the tradition set in previous years – A Christmas Festival tea, a Christmas story for December “A Highland Christmas by M C Beaton and “Poetry Please” for January – then we are back in another year – Phew! 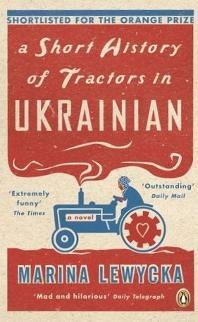 For our December book we read “A Short History of Tractors in Ukrainian” by Marina Lewycka. This book won an award for comic fiction and many of the amusing parts were identified during our discussion – there was much hilarity. As example the loading of a gas cooker on to the home made roof rack fitted to a Rolls Royce. In other respects it was an essentially a tragic story. Nikolai, is an 84-year old Ukrainian-born widower who lived in England after escaping from Stalinist Russia. He marries an attractively formed 36 years old Valentine from the now independent Ukraine who is here on a visitor's visa. She marries to gain permanent residence and access to his money and his house. His two daughters, Vera and Nadia, are outraged. A sub plot is they have never got on but now need to, to protect their father and their inheritance. In the course of the story you see the history of Ukraine, the civil war, the terror and the famine of the Stalin years, the Second World War and a labour camp. The development of tractors – the evolutionary symbols of modern farming, are related from a book on the history of the tractor as they are written by the old man, a former engineer – fascinating! The descriptions of individuals and the relationships are excellent, the somewhat fractured English spoken by the old man and the even more expressive “nearly English” words used by Valentina is fun. On the popularityometer it scored a very acceptable 7.8 out of 10.